Joan Bennett marries likeable racketeer George Raft then shops him to the authorities for his own good. 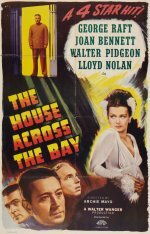 Unfortunately he gets sent to Alcatraz for longer than she anticipated, thanks to a double-cross by his lawyer (Lloyd Nolan) who wants Bennett all to himself. Then there's Walter Pidgeon's wealthy aviator as her third devotee. It must be the parade of jewellery and high fashion (26 changes of costume, according to publicity) that makes her, an otherwise dull character, such an attraction. Occasional expressionistic lighting is not enough to redeem a trite and absurd story - note the apparent ease with which Raft escapes from the island prison when the mood takes him.